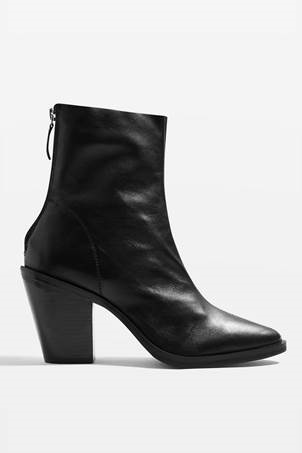 I think these would be good for male street-heeling as, even if on show, they are quite discreetly styled in a 'masculine' way. Just so you know, that 'cuban' style heel is immensely popular this Autumn/Winter. I would agree they are good for male street wearing. I was tempted but I already have an earlier version, though I might prefer these .... The ones I own have a wider, more masculine look to them. You are right about the 42/8 being generous, which isn't always the case with Topshop. I find a Topshop 41 is waaay too small, so don't always expect a 42 to fit. In many styles from other brands, I get into a 41?? 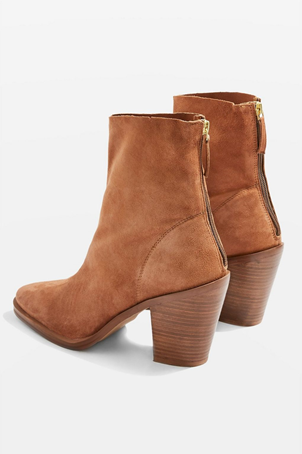 If anyone's interested, I see that the Topshop 'March' boots (as above) are now on offer at only £30.00, although larger sizes apparently sold-out online. Some shop branches will still have them though; there is a 'search' facility. The heel on the UK8 is 3.75"
That looks like a 'classic' western boot. As would the same be in black. If Philip Green wasn't on my sh*t list (actually appears twice), I might be very tempted to chase a purchase. I agree about Sir PG; I try to avoid his empire nowadays. I see today that ASOS has discounted several of its items even further. The Espresso wide-fit boots, for example (in real suede leather and of good quality) are only £15.00! All sizes up to 10UK (Eu 44). Well worth considering! The 'standard' fit is also currently available at £30.00, in all sizes (inc half-sizes) up to UK10. Or there are thick socks (2 pairs) ...! Or there are thick socks (2 pairs) ...! If only I didn't have hot feet, even wearing something as thin as hose.